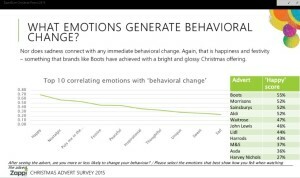 Advertising: Which Emotions Change Purchase Behavior? With the perennial ad fest known as the Super Bowl just a few weeks away, Zappistore conducted an insightful study into advertising during the UK equivalent of the Super Bowl which is otherwise known as Christmas (the full report is here). 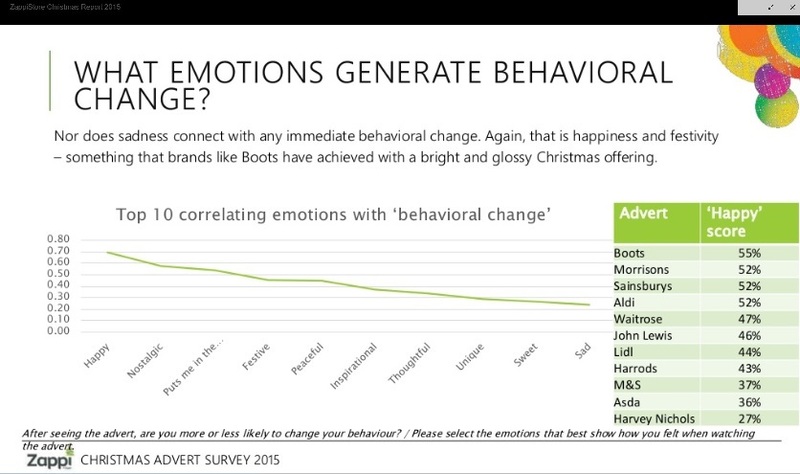 The TV spots from a dozen supermarket chains were tested and the interesting piece of that study for me is the insight into which emotions are driving liking versus which are driving behavioral change. Guess what, they are not the same! Here is the chart showing the correlation of types of emotion people claimed they felt to liking. 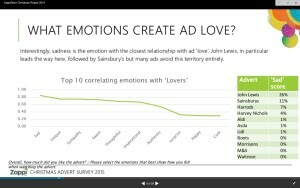 You can see that advertisers were tugging at the heart strings and “sadness” was the emotion most correlated with liking. 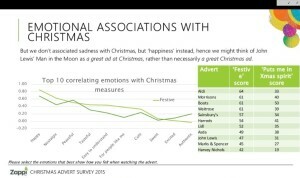 You can see that ‘Happy’ was the emotion most correlated with Christmas, which makes sense. Where is sadness, the emotion that was most correlated with liking? It’s not even on the list. Sadness has no place at Christmas! Now for the real litmus test. Which emotion is most associated with behavioral change (i.e. potentially shopping at a different supermarket)? The chart below shows that the top emotion is again Happy, followed by some associated terms such as Nostalgic, Peaceful and Sweet. And where is our liking champion, Sadness? Dead last on this chart. This tells us a few very interesting things. First, that liking an ad does not necessarily correlate with what we as marketers really want = a change in behavior! Second, that positive emotions (at least in this study) are more correlated with behavior change than negative emotions. 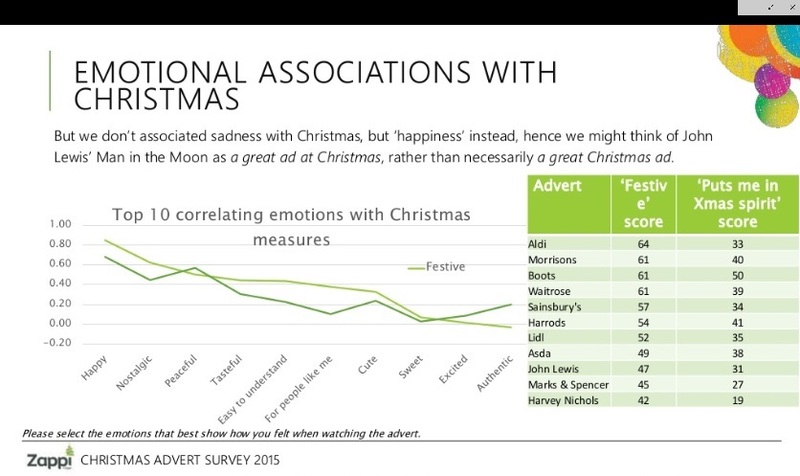 Third, the advertisers that communicated the emotions that were most appropriate for the THEME of the ad (Christmas) were also most effective in eliciting emotions that cause behavior change. That last part makes a lot of sense – if you’re trying to get me to shop for Christmas items at your store, wouldn’t you want to associate your store with Christmas emotions? I’ll check back in post-Super Bowl (the US version) with some thoughts on those ads. One thing related to this post that I always watch for and seem to see more of during the Super Bowl: ads that are very entertaining (i.e. high liking) and when they are over you have no recollection of what brand they were selling. How am I supposed to buy it if I can’t remember what it’s for? No matter how entertaining, that is still poor advertising. WGM partners with Zappistore on fast and cost-effective quantitative testing from advertising to package design to new products. If you want to know more, just give me a buzz. This entry was posted in Branding on January 18, 2016 by Hugh Williams.